Dinosaurs World Hidden Eggs 2 has five levels of finding hidden Dinosaurs eggs within the time limit. Let’s see how much score you will get in the challenge! Behave as the most professional archaeologist looking for dinosaur eggs in the shortest possible time. You will find them using the magnifying glass and sliding it carefully over amazing images of dinosaurs in action. This game can be played on all devices. Enjoy and have fun in playing this free online mobile hidden object game and good luck finding all hidden eggs. 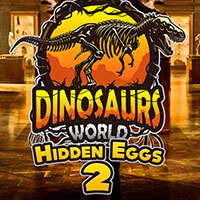 Dinosaurs World Hidden Eggs 2 is a free online hidden object game on Hidden4Fun.